It's been so long, dear Lender's bagels. Not since I was in high school, about a zillion years ago, have I had the pleasure of chowing down on you. I have distinct memories of my mother travelling downtown to pick you up. She didn't complain, but would get VERY annoyed when she'd wake up the next morning and my Baby Brother and I had eaten a whole sleeve. "These are too expensive to go through so fast," she'd muse. Baby Brother and I would nod...and then polish off another few. When I graduated and went off to university, your delicious soft insides and thin crunchy exterior were something that I missed. I'd come home and ask if we had bagels, only to be directed to the bread drawer. Sacrilege, as Lender's Bagels are kept in the fridge. Apparently my mother was too busy to drive the 45 minutes to get her daughter's favourite breakfast food. It's cool. I got over it. 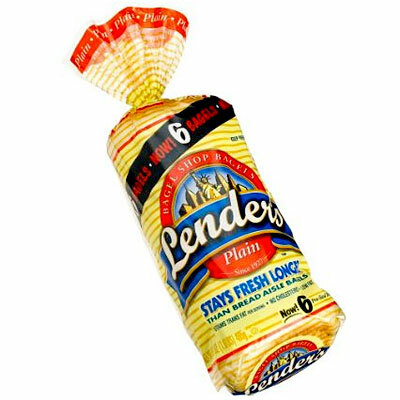 "Hey, have you ever heard of Lender's Bagels? They're really the best. It's been forever since I've had one. I miss them." "Do you mean these here?" Then she opened up a refrigerator door, picked up a package and handed it to me. Lo and behold, it was YOU, dear Lender's Bagels! In all of your tiny glory. And not just in one flavour, but two! Granted, your other flavour choice was onion (*gags*) but it's cool. I forgive you. The best part? A sleeve of six of your delectable delights cost ONE DOLLAR AND FIFTY FOUR CENTS! Naturally I filled my cart like an extreme couponer I bought two, for a whopping total of just over three bucks. So thank you, Lender's Bagels. Not only for coming back into my life in such a funny way but for being in a Wal-Mart that's less than an hour away and, most importantly, so freaking cheap! And now it's time for breakfast - bacon and egg sandwiches, baby!! Aww, what a happy reunion! Hope they were at least as good as you remembered, if not better!